Shortbread and butter cookies have always held a special place in my heat (I’m sure it’s just the butter in them clogging my arteries). I’m not sure what it is that brings me to them but something just does. Perhaps it is the sweet, familiar taste or the semi-crispy-crunchy texture of the cookies. Whatever it is, I really enjoy shortbread cookies but rarely eat them. As I have mentioned, I have really weird eating habits 99% of the time. The only time I break them, is for the benefit of Grandma’s Backyard. Your welcome. For the low price of $7.00 (ha!) 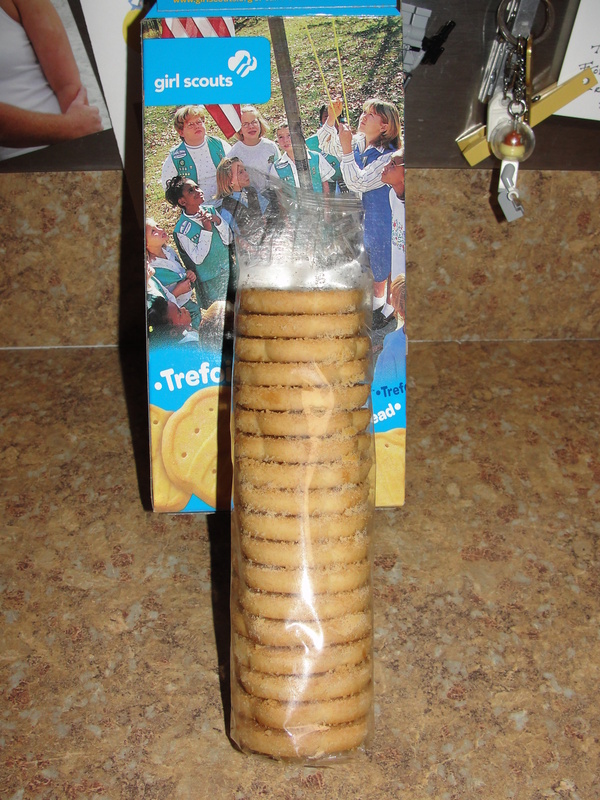 we now have two boxes worth of Trefoils…the Girl Scout version of Shortbread Cookies. These are certainly the most expensive shortbread cookies that I have ever had and they are certainly not the best. Even though they aren’t the best, they are definitely the best value as far as Girl Scout Cookies go…the box includes a whopping 35 cookies with each serving being 5 cookies. I decided to open up the box a week or so ago and have a few cookies. Even though the serving was 5 cookies, I only opted for 3. I was eating these purely for the blog and didn’t feel like a ton of cookies. 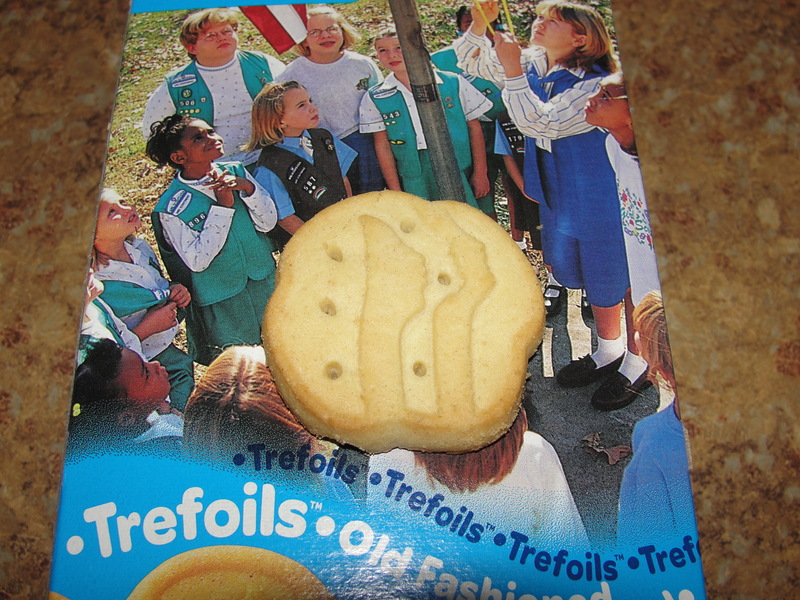 The design on the Trefoils is the Girl Scout Logo. Yes, I know most of you didn’t realize that and thought it was simply just squiggly lines. But, alas, it is the Girl Scout Logo. As with the Thin Mints, the size of the Trefoils seemed smaller. Not by much but certainly smaller. For my first cookie, I took a bite into it. I found the familiar semi-crispy-crunchy texture of shortbread cookies that I love. What I didn’t find was the sweet, familiar taste. I finished the cookie and still didn’t find the sweet, familiar taste. 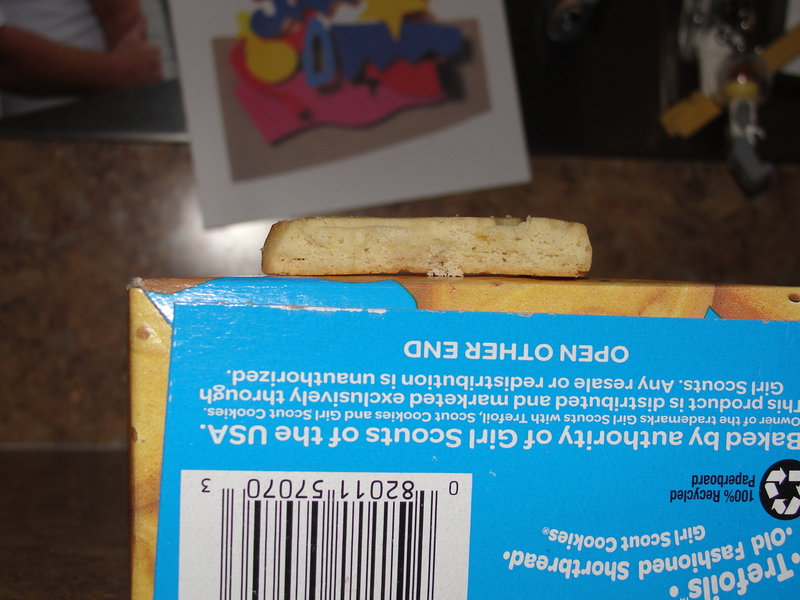 The cookie itself is pretty thin, much thinner than shortbread cookies usually are. I guess they figure you are getting 35 cookies in a box so just deal with it. I continued to eat my two other cookies and was still not impressed with the taste at all. I could kinda taste traditional shortbread cookies in the Trefoils but the taste was not popping in any way. I was really bummed out about this. Like really bummed. Where is my sweet, familiar taste? Where is that buttery aftertaste that lingers in my palate? While the cookies had the right texture they did not have the right taste. I feel as if maybe I’m being too hard on the Girl Scouts but c’mon…it’s a shortbread cookie. It’s not rocket science. If I can buy a huge tub of Royal Dansk cookies for cheap or have elves cooking in a tree make me Sandies, then the Girl Scouts should be able to produce a decent shortbread cookie. Yes, they get the texture right but they just don’t nail the taste down. I shouldn’t have to ask myself if I am eating a shortbread cookie or not…I should just know. So I have ranted long enough. After eating my 3 cookies, I had no desire to eat any others and have not in the time since. Taylor seems to enjoy the cookies and has been eating them so at least they will not go to waste. I can’t stand wasting food and would feel obliged to eat them if Taylor or Mommy wasn’t doing so. Will I buy Trefoils again next year? Probably but, I certainly won’t be eating them. Perhaps I will have a few more before they are all gone this year but I doubt it. They may still be around but that Sweet, Familiar Taste is surely gone.